Oz Conservative: Who is the most privileged in America? I don't want to get into an oppression Olympics with Asians - the data is interesting because it undercuts the SJW "white privilege" narrative. Japan, Taiwan, Asia and unused areas of Africa are not exempted from mass immigration and critique (privilege or not) because of their CULTURE. It's because they're NOT WHITE. And the same goes for internal politics in the US. As an Australian, you may not be aware that, in the US, much of the burden of "affirmative action" (i.e., reverse discrimination) in college and graduate school admissions falls on Asian-Americans. 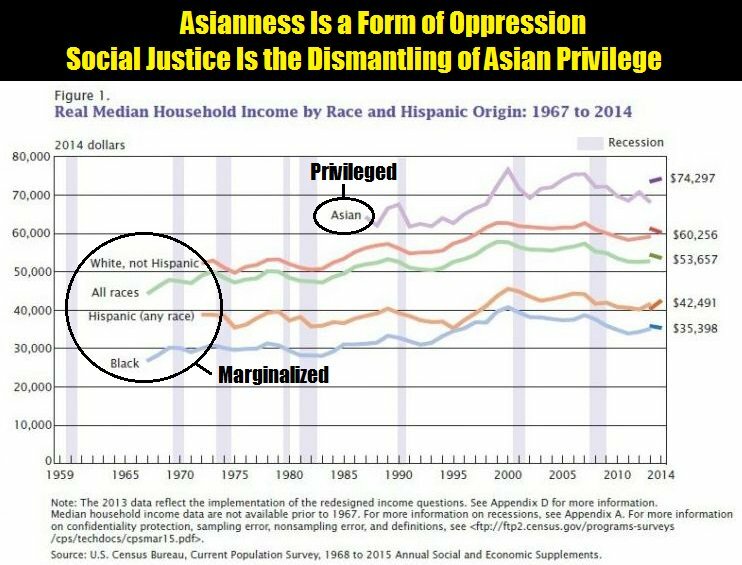 That's because Asian Americans do so well educationally. Over 50% of Asian Americans aged over 25 have a degree compared to 28% of all Americans aged 25 and over. At the University of California, Berkeley, 36% of students are Asian Americans. I'm not listing this in order to argue for affirmative action. It's to point out the flaws in the "white privilege" argument run by SJWs. In terms of education outcomes Asian Americans do better than anyone else. It's even more marked here in Australia as our immigration programme is run by bringing Asian students into our universities as a pathway to citizenship. It gives our campuses an unusual demographic - very strongly Asian.